As the 20th anniversary of the project approaches, PCL Construction is looking back at the role it played in the making of a Toronto landmark. International engineering firm Thornton Tomasetti has opened its first Canadian office in Toronto as part of a strategic plan to strengthen and expand its presence across this country. Custom acoustic panels enhanced the atmosphere in Brasserie Bernard, a Parisian-style restaurant in Montréal. Brasserie Bernard, a Parisian-style restaurant in Montréal, used lightweight, direct-apply acoustic panels to develop an atmosphere suitable for comfortable communication. In addition to providing acoustic benefits, the custom golden-yellow panels harmonize with the multidimensionally painted ceiling and walls, and contrast with the black wood and leather banquettes. 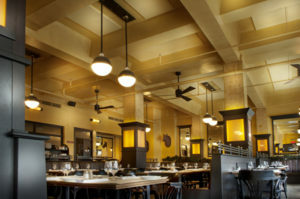 The restaurant has hardwood floors, oversized mirrors, and dark wood pillars topped with contrasting golden-yellow tiles. Without an acoustical treatment, hard surfaces in a space would reflect sound energy. Excessive sound builds up and produces higher levels of background noise. This often results in people speaking louder, making it even more difficult to have an enjoyable conversation. Approximately 56 m2 (600 sf) of the 204-m2 (2200-sf) dining area received acoustic treatment with 600 x 600 mm (24.62 x 23.62 in. ), 50-mm (2-in.) thick custom panels finished with a specially formulated water-based, golden-yellow acoustic coating. The panels were quickly adhered to the ceiling with adhesive. Smooth-surface, direct-apply wall and ceiling panels have therefore provided superior sound absorption and design possibilities at an economical cost.